Unsafe weather conditions are hampering the search for several people who have gone missing as Winter Storm Leo hits the West Coast, including a toddler. At least four people have died in California from the effects of the storm and hundreds more were evacuated over the weekend. Officials increased the death toll to four when a body was found Monday in the Harbor City area of Los Angeles after floodwaters receded, according to the Associated Press. Fire Department spokesman Brian Humphrey told the AP that the body may be that of a man who went missing Sunday night. Rescue crews searching for a toddler reported missing found the body of a man in a rain-swollen creek in the North County community of Rainbow, the San Diego Union-Tribune reports. A submerged car was found near the man’s body, and swift-water rescue crews plan to search inside for a child reported missing. It is unknown if weather conditions were responsible for his death. The U.S. Coast Guard told the AP it suspended a search for two people who went missing in the water near a beach on the Monterey Peninsula south of San Francisco on Saturday evening. The search was called off because of bad weather and unsafe search conditions. An 18-year-old woman, whose car plunged into a rushing creek southeast of San Franciso on Saturday, is also still missing. 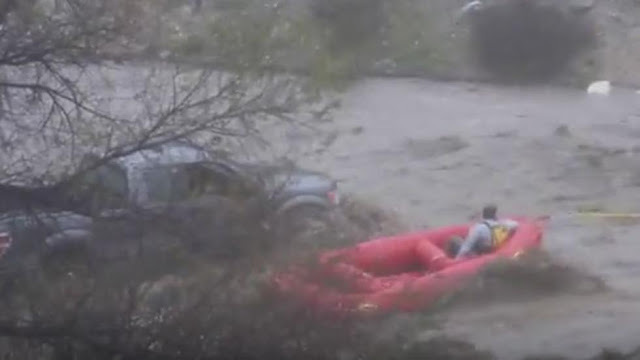 In San Bernardino County, east of Los Angeles, firefighters were able to pull off a dramatic swift-water rescue of a couple whose pickup truck was trapped in surging water west of the Cajon Pass, the AP reported. Television footage showed rescue crews sending a raft, which was anchored to a firetruck, into rushing brown water so the trapped couple could climb aboard, one by one, from the car's passenger window. Another pickup – occupied by a toddler, a young boy and two adults – got stuck on a washed-out road in Murrieta, ABC7 reports. Firefighters responded to Monroe Street at the 15 Freeway, where at least one of them swam out to the vehicle while attached to a safety line. The driver and passengers were helped out of the truck and pulled to higher ground. An avalanche trapped two cars and closed California State Highway 89 between the Squaw Valley ski resort and Tahoe City, California, but no injuries were reported. More than two dozen mudslides blocked highways in Central and Southern California Monday morning. The same heavy snow that triggered the avalanche has closed schools throughout the Reno-Sparks area and caused a roof to collapse at a liquor store in Lake Tahoe. A thunderstorm brought ashore pounding hail northwest of Los Angeles in Santa Barbara County, where a tornado warning was briefly issued. No tornadoes were reported but wind gusts topped 60 mph. One person was killed Sunday when they lost control of their vehicle during heavy rain and collided with a telephone pole in Pomona, the Pomona Police said in a press release. Ukiah Valley Fire Officials said that a 36-year-old woman was killed while she slept when a massive, 125-foot-tall oak tree was uprooted likely by heavy rain and crashed through her home Saturday morning, The Santa Rosa Press Democrat reports. The woman has yet to be identified, but her boyfriend, who slept next to her in the bed, narrowly escaped the incident when the roof came crashing down on them, just missing him. Further south, a 23-year-old woman has succumbed to her injuries after she and a companion were swept away by high surf near San Diego Saturday. The approaching winter storm kicked up high surf; lifeguards told NBC San Diego that waves up to 15 feet high topped with 2 feet of foam made rescue efforts difficult. “We did see her, but in the amount of the time, the surge was coming in and out she’d appear and then disappear in the foam,” said Lieutenant Rick Romero. The two women were swept off the rocks at Santa Cruz Avenue and Bacon Street - near San Diego's iconic Sunset Cliffs - Saturday evening just after 5 p.m.
"They were like right in front of us, they were like right there and then all of a sudden, they were gone," witness Janice Ambrosiani told CBS 8. "It's not like they were way down in an area where they shouldn't be, we were right on the wall there on the sidewalk." A bystander helped to rescue the first woman, but lifeguards spent 40 minutes searching for the second woman in the high waves and dense foam. Massive waves destroyed the S.S. Palo Alto, a historic ship from the World War I era, on Sunday. The stern was broken away from the rest of the boat. Mandatory evacuation orders are in place in areas and several mudslides closed highways in the Santa Cruz mountains. "We're packing and leaving because the muds are coming, the mudslides," Duarte resident Ralph Olivas told KCAL, adding that the risk "comes with the territory living up here." Some residents refused to leave, even as volunteers went door-to-door Saturday night to alert residents in Duarte of evacuation orders for communities affected by the Fish Fire, ABC 7 reports. The city is opening the Duarte Community Center, 1600 Huntington Dr., as an evacuation center starting Sunday at 7 a.m. Authorities ordered evacuations near wildfire burn areas in Santa Barbara, Los Angeles and Orange counties, the AP reported, citing the possibility of debris flows that could restrict access for emergency responders. In Santa Clarita, about 120 homes in areas damaged by the Sand Fire were ordered to evacuate Saturday, KTLA reports. An evacuation center is set up at Canyon High School. A mudslide and fallen trees blocked both lanes of Highway 17 in the Santa Cruz Mountains, NBC Bay Area reports, and a semi-truck driver who slammed into the mudslide and had to be towed away from the scene. The slide was cleared shortly after. Two other minor hazards included a downed tree in the southbound direction near Redwood Estates Road. Another mudslide also blocked the right lane of southbound traffic near Summit Road. Another small slide closed Highway 9 between Santa Cruz and Felton. An intense winter storm continues to move through Southern California, bringing hail, lightning and possible thunderstorms as the entire region remains under a flash flood watch until 10 p.m.
A winter storm warning is scheduled to remain in effect until 6 p.m. for the mountains of Ventura and Los Angeles counties, with snow levels set to drop to 4,000 feet. Gusts of up to 60-80 mph are forecasted those areas and the Antelope Valley. A flash flood watch was in effect for the Los Angeles County coast until 6 p.m., as lighter showers and chances of thunderstorms, which may produce small hail, continue into the night. West winds are also expected to reach 15 mph in the evening, according to te National Weather Service. A high surf advisory was issued for those areas at least until 9 a.m. Wednesday. Orange, San Bernardino and Riverside counties are all under flash flood watches at least until 10 p.m. Monday night. Los Angeles and Orange counties, as well as the valleys and Inland Empire, will see chilly rain conditions with highs in the mid-to-upper 50s. Beaches will be cold and rainy with highs in the upper 50s. Swells from the west could create 5 to 10-foot breakers. The mountains will see up to 2 feet of snowfall above 7,000 feet. Highs will be in the upper 20s. Deserts can expect cool showers with highs in the upper 40s. The rain will lose strength by Monday evening and showers will linger Tuesday morning. Cool temperatures will be in the forecast until the weekend, when conditions are expected to warm up. The caboose in the storm train and river of moisture that has been battering the western United States this week will deliver one final blow to California into Monday. “Another moisture-laden storm system will slam into California through Monday morning, bringing more heavy rain and mountain snow,” AccuWeather Meteorologist Jordan Root said. Two people were reported dead following the destructive storms that swept across the state throughout the weekend. Three others, including one child, are still missing, as of Monday morning, according to CNN. Rain totals from the second half of the weekend to Monday will total 3 to 6 inches in the lower foothills of the Sierra, while 1 to 3 inches will fall from northwestern California to San Francisco, Los Angeles and San Diego. Locally higher amounts can be expected, especially in upslope areas. Those totals will come from the soaking rain during the second half of the weekend and the locally heavy showers and isolated thunderstorms that follow into Monday. Flooding issues threaten to ensue across California, outside of the deserts, as the rain pours down on the saturated soil. Streams and rivers in northern and central California should once again rise and could overflow their banks. Strong winds accompanying the rain threaten to cause damage, power outages and could easily down trees sitting in the saturated soil or that have been weakened by previous storms. The combination of the rain and wind can lead to flight delays and hazards for motorists. Downpours will reduce visibility and heighten the risk of vehicles hydroplaning at highway speeds. Dangerous crosswinds can overturn high-profile vehicles. In addition to the heavy rain, another long-duration snow event will further bury the mountains. Such news is good for ski resorts and the region’s water supply heading into the warmer months. However, dangerous travel will result with likely road closures. This includes on I-80’s Donner Summit. “The Sierras will likely see another few feet of snow through Monday,” Root said. Plunging snow levels will cause rain to change to snow in the mountains of Southern California. A fresh 8 to 16 inches could fall at the ski resorts. Enough snow to cause slippery travel will coat the Grapevine section of I-5 later on Sunday night into Monday. “There can even be a little snow that may impact travel through Cajon Pass,” Root said. Disruptive snow will not just be confined to the mountains of California, but will spread to Reno, Nevada, and into the Rockies. Major travel disruptions are anticipated along the I-40 corridor in the Flagstaff area, where additional snow totals will exceed 6 inches. A turn to quieter weather will then follow this major winter storm. “There will be another storm system that will dive south near the coast of California [later on Monday into Tuesday], but this will be much weaker than the previous storms,” Root said. Lighter periods of rain and mountain snow starting along the northern California coast will gradually diminish as the storm drops southward. “High pressure will then build across the West towards the end of the week which will put an end to the storm train,” Root said. However, there is concern for potentially damaging and disruptive Santa Ana winds to develop across Southern California toward and during next weekend. 0 Response to "California Flooding Prompts Rescues; Winter Storm Leo Hampers Search for Missing People"